Powered by pure passion, GameConnect is what happens when gamers get serious. As well as providing news, features and reviews for games on all platforms, we host and maintain free servers for the most popular titles, and regularly run competitions and events. GameConnect and SteamFriends are both communities we have been working on since 2004. Join us for the latest scoops, reviews, features and downloads, and come meet us in the online arena of our servers. It’s the fight of your life. As you might know, GameConnect has been around for many years. It all started with a bunch of friends playing Counter-Strike and other Source engine based games together and for fun. After a while, some of them came up with the idea to create plugins and mods for the engine. That’s when Sourcebans, Steambans and many other projects were born. GameConnect CS:GO Public server online! 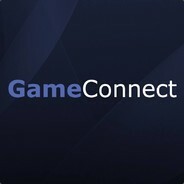 "Powered by pure passion, GameConnect is what happens when gamers get serious. Providing the best news, features and reviews for games on all platforms." Yo guys, long time ago! Have any thoughts about getting the best community up running again? It would be great to have all the amazing player back. So we can have a lot of fun like the old days. Since the beginning of CSS with GC Now I would like to make a comeback with CS:GO see you around! People check out my discussion about Steam Trading Cards & Badges crafting!